Todays weather is a bit strange, one minute the sun is splitting the stones and it's lovely and warm then next minute it's bucketing down and absolutely freezing. So it's hard to figure out what to wear in this kind of weather. Finally after deciding what to wear I decided why not do an outfit and makeup of the day post, so enjoy! I adore this jumper as its one of those baggy style ones, when I bought it I actually thought it was a cropped one as its cut off at the bottom, but it comes to my hips so it is full length (which doesn't bother me) and its so soft!! What I also like about it is you could definitely dress it up or down, obviously I chose to dress it down today but you could pair it with a fancy skirt or shorts with a pair of heels to dress it up. Overall this outfit was great for the weather today as I wasn't too warm or too cold wearing it! 1. The foundation in the kit (how to look the best at everything) is sadly too dark for my skin tone even though I bought the light kit, the fun of having snow white skin! However I did want to try out the foundation so because my jumper had a high neck on it I blended the foundation down my neck so I could wear it for the day and see how I find it. 2. I am in love with the Rockateur blush and don't think I've ever seen a more gorgeous blush colour than this one and it also smells really nice! 3. You know how I love gel liner and won't stray from it, Supercat which is a liquid liner from Soap and Glory may change that. The application was so easy thanks to the marker styled pen and it didn't budge or go all over the place. 4. 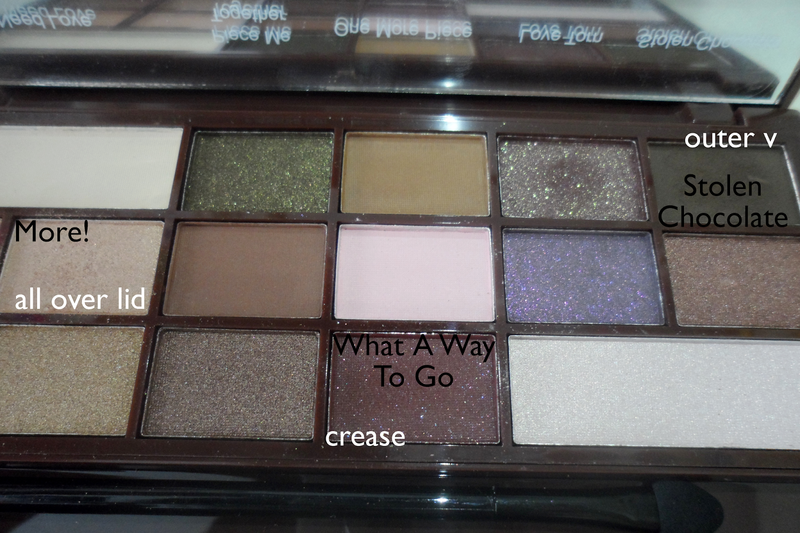 I Heart Chocolate palette by Makeup Revolution, the shadows in this are an absolute delight to work with! They're so pigmented and blend beautifully and I may be in love! Oh and best of all they're cheap! Your eye makeup looks great!! And I love the quote "Full Time Fashion Blogger" -- so funny! Love your eye makeup in the picture, you're really good with it!